On Saturday, I visited Nymans Gardens in Handcross for a foray led by two experienced members of the West Weald Fungus Recording Group. The WWFRG mainly runs forays in Surrey, but this one was quite close to me so I went along. There were quite a few inexperienced people taking part, so the foray worked on some of the more basic fungi. That was ideal for me though, as we found excruciatingly common fungi I had previously overlooked. The walk started in the arboretum. There wasn’t much there apart from a patch of Sulphur Tuft (Hypholoma fasciculare) and a single fruit body of Agaricus silvaticus. The Sulphur Tuft is an abundant species, found growing on living or dead tree matter and sometimes on nearby ground. But don’t worry, barely any fungi have any detrimental effects on trees. When we reached the woodland, more fungi started to appear. In patches of fresh grass there were a few Mycena, very small and delicate fungi. Near a stump was a huge patch of Glistening Inkcap (Coprinus micaceus), so called because of the small glistening white scales on the cap. We also came across lots more Sulphur Tuft! Butter Caps (Collybia butyracea) were also plentiful in the woods, a few different colour variations too. This is one of the species I’ve previously overlooked but now it seems so recognisable. The cap of Butter Cap is very viscid, like melted butter. They’re an average sized fungus, some having brown caps and some having butter coloured caps (another reason for the name Butter Cap). A bit further along the path was a Sycamore log, which was very popular with fungi. These included Candlesnuff (Xylaria hypoxylon), Honey Fungi ( Armillaria cepistipes), Dead Moll’s Fingers (Xylaria longipes) and a scarce species called Pseudocraterellus sinuosus. The candlesnuff was very interesting and I learnt that it gets its name from the fact that when it is flicked, the spores burst out of the fruiting bodies in a pale ‘smoke’, like when you snuff a candle. To finish off the walk, the leaders gave me a challenge. We had found a Russula on the walk, which needed identifying. At the start of the walk I was given a book on Russulas by the leaders, called “The Genus Russula in Great Britain” by Geoffrey Kibby. I was to use this book to find out what species this Russula is. It discolours reddish-brown before black when it is cut, but the gills are too crowded for some other species with this feature. It also tastes very acrid when the gills are chewed for a short while. All this points to Russula densifolia! A Microscopy Workshop: a great day out! On the way to Wales this summer (see Teifi Marshes, home to the Welsh Wildlife Centre) I stopped off at Brunel Microscopes Ltd.’s HQ in Chippenham to look for a microscope that would suit me best. I bought a microscope mainly for looking at fungi spores and other fungal structures, but I also look at other things like the leaves of Fissidens spp., a genus of mosses which are absolutely tiny. I’m still getting used to using the microscope, so today I went to a beginner’s microscope workshop in Great Bookham run by the West Weald Fungus Recording Group. I was asked to bring my microscope to the workshop, so I did, but I left the stuff like the prepared slides, pipettes, coverslips etc. behind thinking that I wouldn’t need them. However, that turned out to be a mistake as I took just a few minutes to set myself up, whereas others started unloading whole dissection kits, oil immersion, all the chemicals and stains… at least there was a plate of Jaffa cakes to keep me busy! The day started with a talk by Maurice Moss, who used to be a professor at Guildford University. He brought in two microscopes, one a dissecting microscope for larger objects like feathers and moths and the other a standard one like the one I have to look at fungi. He taught us all about how polarising filters can be used to look at colours in crystals and the colours the filters produced were phenomenal. He also let us look at some of his prepared slides, such as a peacock head feather, which again had superb colour. After Maurice’s talk we chatted amongst ourselves about fungi (and other things!) and some people were able to recommend some useful tools and books. Many were quite surprised that I had no books whatsoever, and they had no hesitation in recommending “Mushrooms” by Roger Phillips. This looks really good and I think it will be a good purchase if I can find a copy , as well as a key to the genus Russula (a tricky genus) by Geoffrey Kibby, who regularly comes along to WWFG meetings. After lunch was a talk by Barry Hughes, the author and photographer behind the Collins Fungi Guide. Many of the photos included in the book are taken in Surrey and West Sussex! He did a talk on spores and he handed out a few spore prints for us all to look at. He then asked us to look at them under the microscope and decide what shape they were using a sheet he handed out. 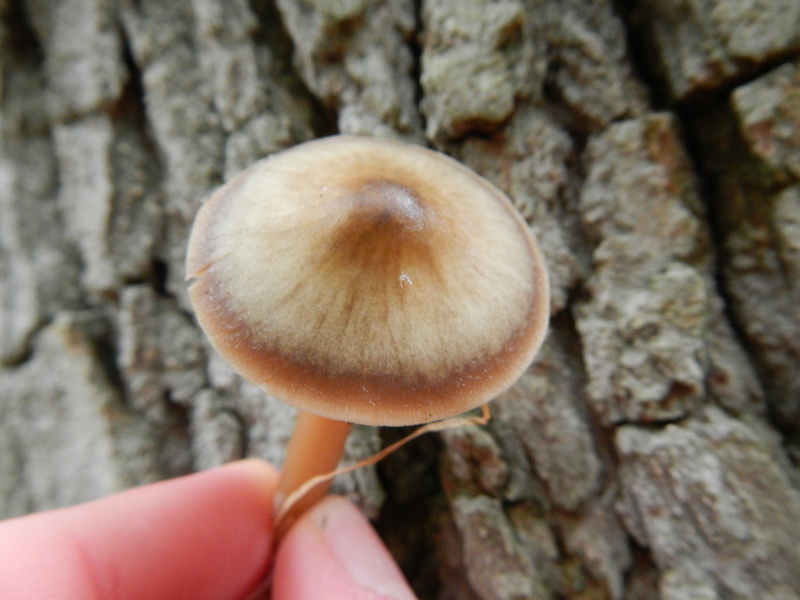 My spores were from the genus Inocybe and almond-shaped! I learnt that there are a few tests you can do on spores to help identify it. You can see if the spores are amyloid, dextrinoid or neither by applying iodine using Melzer’s reagent or Lugol’s solution. 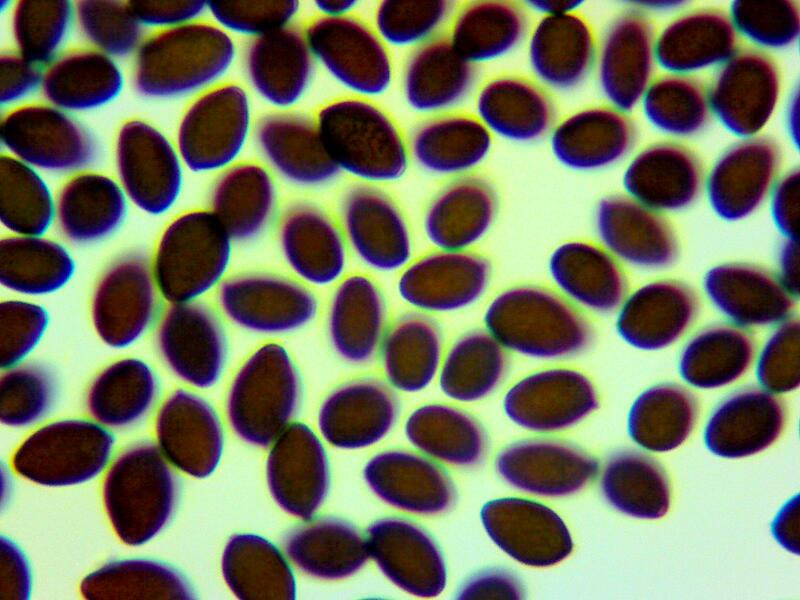 If the spores turn black to blue-black when exposed to the substance then they are amyloid and if they turn reddish-brown then they are dextrinoid. Putting a few drops of household ammonia onto the flesh of the fungus. The fungus might or might not have a reaction; if it does then the colour the flesh turns aids an identification. A fun one: the gills of the genus Lyophyllum turn blue with Paradimethylaminobenzaldehyde. When potassium hydroxide (KOH) is applied there is a colour change in some fungi, including agarics and boletes. At the end of the afternoon, I had a really informative day. I learnt lots of new skills which hopefully I will soon be applying back home. I also had the chance to meet some really great people who love to share their interests. One of my spore photos, taken earlier in the year.